FINGERPRINTS - Fingerprint distributions on the 5 fingers! Fingerprint distributions on the 5 fingers! on the 5 Fingers reveal? In this section a new approach is introduced for studying the significance of the most common distributions of the 4 major fingerprint types on the five fingers. The fingerprint on the pointer finger will serve as a starting point, because multiple evidences indicates that this finger appears to be have the most 'individualized' fingerprint of all 5 five finger. NEW: The second part presents a description of the 14 most common 'single hand' fingerprint combinations! There are various systems to classify fingerprint types. However, based on the location of the triradius one can discriminate 4 major fingerprint types: the 'whorl' (featured two triradii: one at both sides), the 'ulnar loop' (featured with one triradius on the thumb side), the 'radial loop' (featured with one triradius on the pinky side) & the 'arch' (featured with no triradius at all). All other fingerprint types can be grouped in one of these 4 major fingerprint types as well (by considering the position of the triradius). Studies have revealed that fingerprints are not commonly distributed among all 5 fingers. The picture below displays the prevalence of the four fingerprint types in 5 world populations (males & females in populations from in respective: US, UK, China, Iran & Nigeria). NOTICE: More details are presented in the article: The Fingerprints World Map. First of all, the picture above shows that in most populations around the world the 'ulnar loop' is (by far) the most common fingerprint type. And in nearly all populations the 'ulnar loop' is least commonly seen in the index finger (and most common in the pinky finger). Additionally, both the 'radial loop' and the 'arch' are most commonly seen in the index finger (and usually least common in the pinky finger). Secondly, sexe differences in fingerprints typically manifest in the prevalence of arches & whorls. The data in the picture above shows that the sexe differences - especially for arches - are by far the smallest in the pointer finger (and the size of sexe-effects are the largest in the pinky finger). And finally, ethnic difference in fingerprint manifest in the distribution of all four fingerprint types. 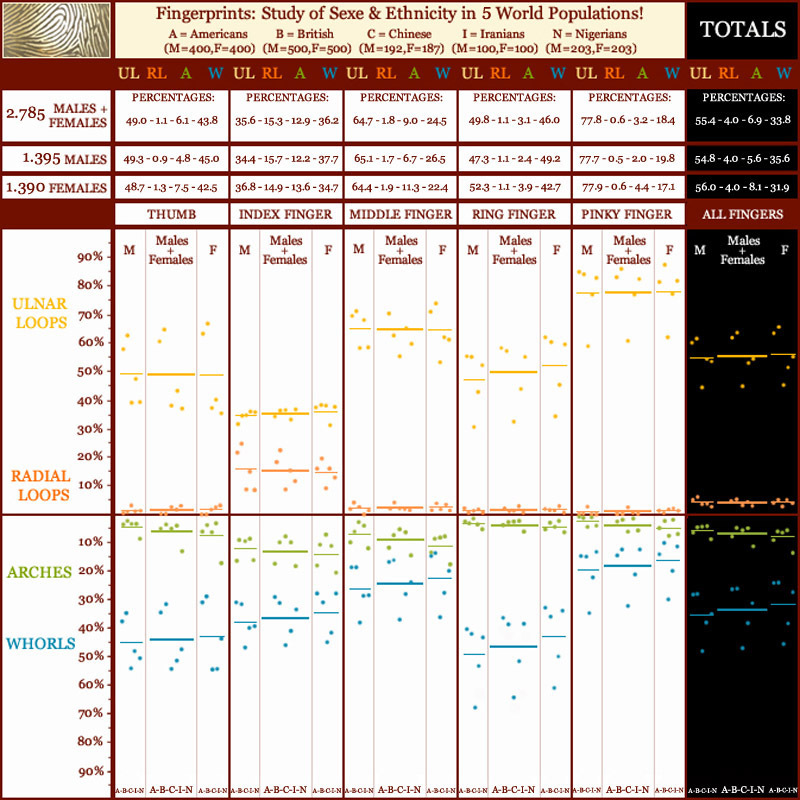 Using the averages for the males and females, the picture above shows that the ethnic variation in the prevalence of all four fingerprint types is the smallest in the index finger (and the size of the ethnic variation for whorls and radial loops is the largest in the pinky finger). The index finger displays not only the largest variation for the four fingerprint types, additionally the effects for sexe and ethnicity are the smallest in this finger. And the reversed pattern is seen for the pinky finger: in all populations (all groups of males & females in all 5 populations) a very large majority has an 'ulnar loop' on the pinky finger. The picture below present an overview of the most common fingerprints combinations on the 5 fingers of a single hand among 6 populations: Americans (US), British (UK), Dutch (Netherlands), Thai (Thailand), Maori (New Zealand) and Ellice Islanders (Polynesia). 14 Fingerprint combinations are displayed inside the picture; in each of the 6 populations these 14 combinations together represent more than 50% (up to more than 75%) of all hands. The distribution of combinations displays that in the studied Americans, British & Dutch samples the distribution is similar, with two loop-combinations (UL-UL-UL-UL-UL and UL-RL-UL-UL-UL) covering about 25% of each sample! However, in Maori and Ellice Islanders - which are know to represent some of the most 'whorled' populations in the world - two whorl-combinations (W-W-W-W-W and W-W-W-W-UL) cover even about 45% of each sample! This implicates that the distribution of patterns tends to vary significantly in populations around the worlds, and for only 3 combinations (UL-UL-UL-UL-UL, W-UL-UL-UL-UL and W-W-UL-W-UL) the prevalence in each of the 6 populations was found to be higher than 2%; additionally there are also 5 combinations where this criteria is met in 5 out of 6 populations. Finally, one can also derive from the data that in terms of the major fingerprints categories one can expect more than 50% of the hands to display 5 or 4 fingerprint types of the same major category!!! NOTICE: In line with the FBI system the major category 'whorls' include: plain whorls, central pocket loops, double loops, and accidental whorls; most variations inside each of these sub-categories include two triradii, while in arches, ulnar and radial loops this characteristic is always missing. • Fingerprints in DIABETES MELLITUS! • Fingerprints in RHEUMATOID ARTHRITIS! • Fingerprints in DOWN SYNDROME! • Fingerprints in FRAGILE-X SYNDROME! Always be aware: even though fingerprints bare the potential to show significant clues for aspects of personality, diseases & syndromes, multiple perspectives of the hand need to be taken in consideration in order to make a well substantiated reliable assessment or diagnosis. "Any hand sign only bares significance for a specific theme when it's presence is combined with the presence of other hand signs that also bare significance for that same theme."